Relax in comfort after a wonderful day of enjoying the Santa Ynez Valley… then walk to restaurants and entertainment. 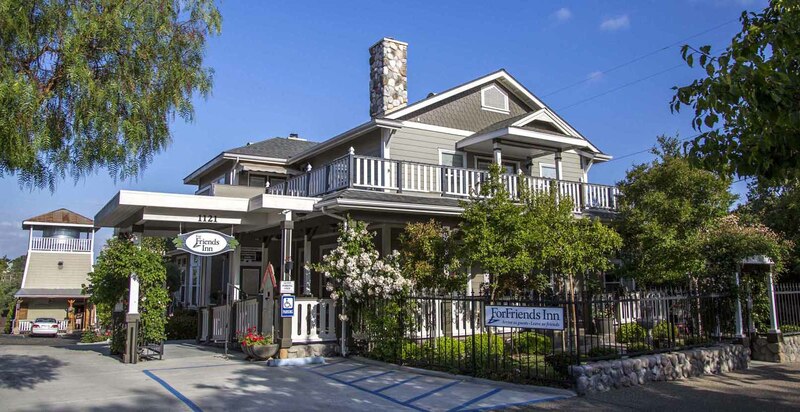 Welcome to ForFriends Inn — a boutique bed & breakfast and Vacation Rental in downtown Santa Ynez, CA — where the place you stay is as fun as the area you visit. Nestled in the heart of Santa Barbara Wine Country and only minutes from Solvang and Los Olivos, the inn is surrounded by acclaimed wineries, restaurants, shops, gaming and world-class entertainment. It’s a one-of-a-kind B&B getaway for adults who enjoy having fun, meeting people and creating lasting memories. There's nothing like it anywhere else in the Santa Ynez Valley. BONUS: You may also book ForFriends Inn as a private VRBO rental. We call it ForFriends Manor and you can reserve 5-room or 7-room packages. Call us or click "Vacation Rental" on our Web site for more info. Holidays available!